With Easter right around the corner, I’ve been spending my free time in the kitchen whipping up some yummy treats. 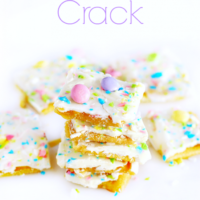 This recipe for “Easter Crack,” a fun twist on the popular Christmas Crack, is definitely something you’re going to want to make for your family and friends this Easter. My family loved it! But be prepared…it is addicting! If you are unfamiliar with Christmas Crack, otherwise known as Saltine Cracker Toffee or Saltine Toffee, it is simply saltine crackers layered with toffee, chocolate and your choice of topping(s) such as nuts, M&M’s, sprinkles, coconut flakes, etc. The sweet and salty combination is delicious and truly addicting! 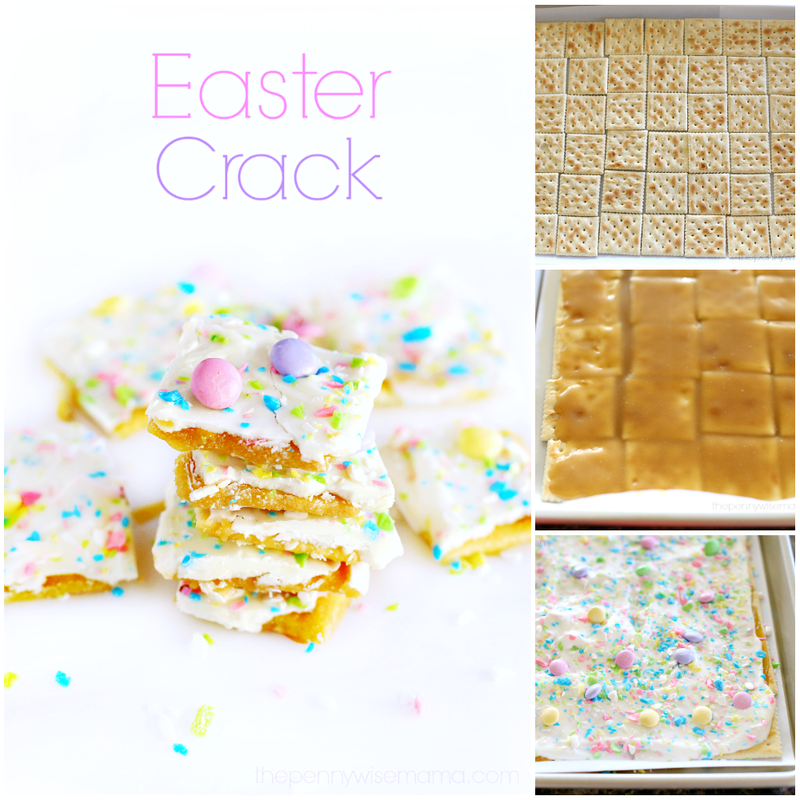 My version of Easter Crack is basically the same thing, only with pastel colors for Easter. Fun, right?! This is one recipe you are going to want to make again and again and the best part is it is SUPER easy. It would be perfect for a holiday party, classroom party, teacher gift or potluck. You could easily whip up a batch (or two) and arrange on a festive plate, or you could even bag up individual treats and tie them with a cute gift tag. You will probably want to make an extra batch because it will be eaten up quickly! 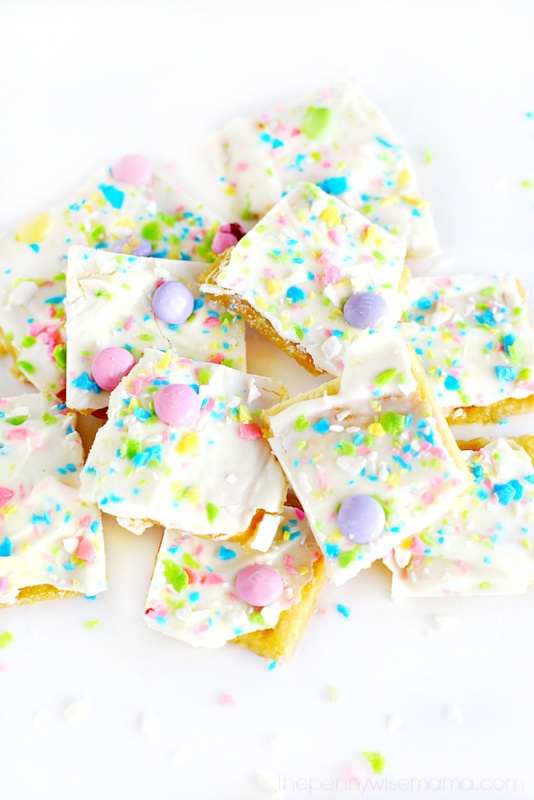 To make this recipe you’ll need saltine crackers, butter, light brown sugar, white chocolate chips or vanilla melting chocolate, pastel sprinkles and Easter/Spring M&M’s. You’ll also want to make sure that you have parchment paper and a rimmed baking sheet. I have this one from Nordic Ware and it is AWESOME. I’ve used it a million times and it still looks brand new. Save yourself a trip to the store + get free shipping when you order on Amazon! 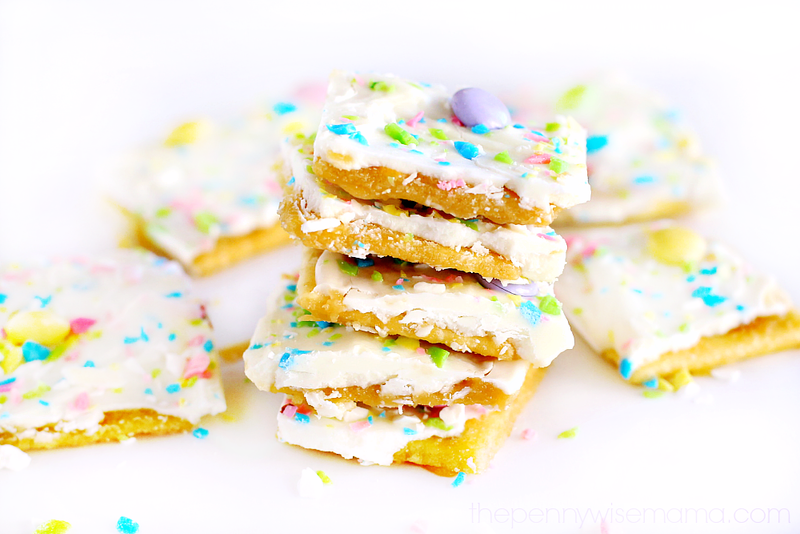 This recipe for Easter Crack features saltine crackers layered with toffee, chocolate and your choice of fun Easter toppings. 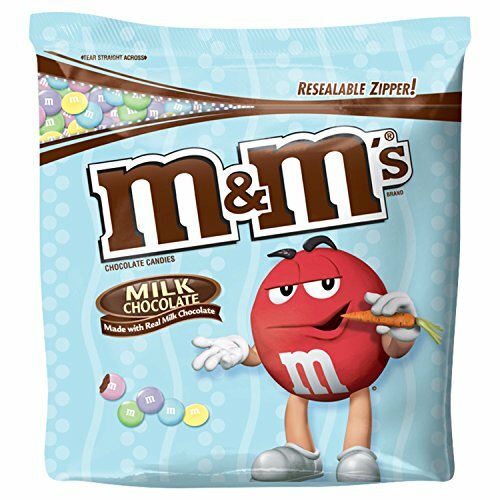 The combination of sweet and salty makes them truly addicting! 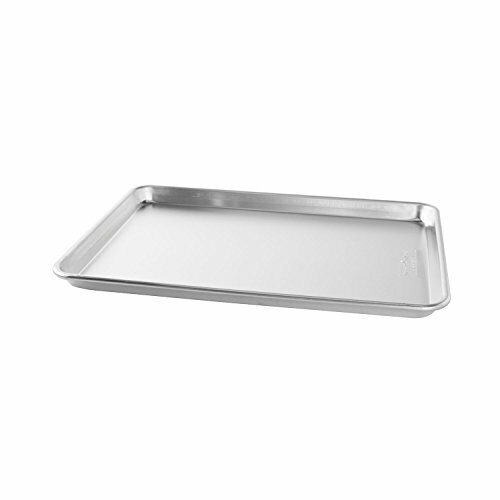 Line a rimmed baking sheet with parchment paper and even rows of saltine crackers. Depending on the size of your baking sheet, you should be able to fit 48-50 saltine crackers without overlapping them. In a medium pot, melt butter and brown sugar over low heat. Once the butter is melted, turn the heat up to medium-high and stir constantly until it turns into a thick, bubbly syrup. Remove from heat and pour over saltine crackers. Use a spatula to spread the mixture and to evenly coat the crackers. Place baking sheet in oven and bake for 10-12 mins. Meanwhile, melt white chocolate chips or vanilla melting chocolate according to package directions. Remove baking sheet from oven and pour melted white chocolate over the top. Use a spatula to spread it evenly over the toffee. Then top with sprinkles, M&Ms, nuts or any other toppings you would like. Place baking sheet in refrigerator or freezer for 20-30 mins to allow the toffee and chocolate to harden. Once it is completely hard throughout, remove and break into small pieces to enjoy. 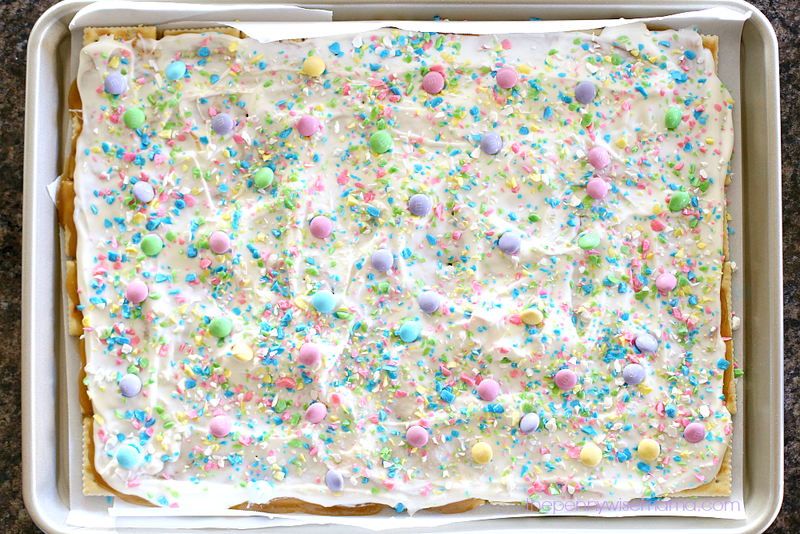 You can find more delicious Easter recipes here! Have you ever tried saltine cracker toffee? Which toppings are your favorite? This is so pretty and looks delicious! I like that it is so easy to make with items I already have in my pantry. Thanks for sharing the recipe. This looks like such a pretty treat! I love the salt & sweet together, too! I am going to make this recipe next Easter. 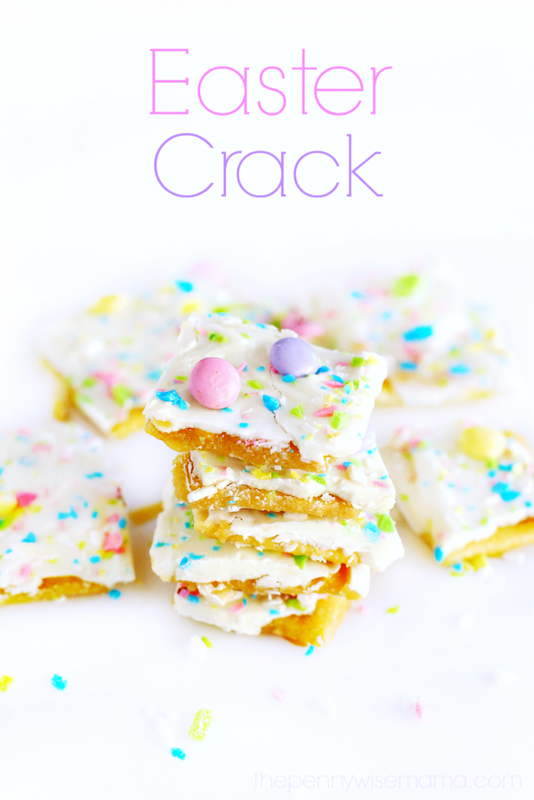 I really think the Easter Crack is so pretty and fun to make with my niece. Thanks for a fun recipe.